The war on coal: You can’t blame it all on the Obama administration. And the aggressors are winning. 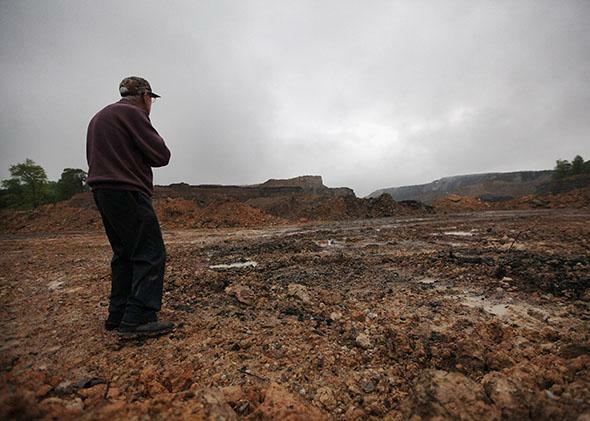 McKinley Sumner, 79, views surface coal mining operations near his home in the Appalachian Mountains on April 18, 2012, in Montgomery Creek, Kentucky. There’s a war on coal in this country. Sen. Mitch McConnell, who represents a coal state (Kentucky), predictably blames it on the Obama administration. True, much of the debate over coal, which accounts for about 40 percent of electricity production in the U.S., breaks down along cultural fault lines: red state vs. blue state, coasts vs. interior, rural vs. urban, climate change deniers vs. climate change catastrophists. It is true, as well, that the Environmental Protection Agency earlier this year proposed a new rule limiting emissions on coal plants, with more to come. But the Obama administration isn’t really the main aggressor in the war on coal—far from it. The frackers who have liberated huge quantities of natural gas from shale rock—not exactly a bunch of tree-huggers—started the hostilities. Natural gas is now cheap, abundant, and burns much more cleanly than coal. Meanwhile, utilities are prosecuting the effort by making cold cost-benefit analyses that lead them to dump coal. The latest case in point: Duke Energy. This North Carolina–based company is as red-state as they come, with operations in both Carolinas, Ohio, Indiana, and northwest Florida. One of its former executives, Pat McCrory, is the Tea Party–friendly governor of North Carolina. Coal accounts for about 40 percent of its electricity-generating capacity. On Wednesday, Duke announced it would build a giant, $1.5-billion 1,640-megawatt natural gas plant at its Crystal River complex—a sort of energy mega-mall 85 miles north of Tampa. Crystal River currently houses a huge nuclear power plant, which is soon to be retired, and a four-unit coal-fired plant with a capacity of nearly 2,300 megawatts. Two of those coal-burning behemoths—which date to the 1960s and have about 950 megawatts of generating capacity—will be shuttered once the new gas plant is completed, by 2020. Why? Large utilities like Duke are increasingly finding that being associated with coal production, and making electricity from it, is a liability. Given their long-term debt, and their need to present long-term plans to regulators, utilities need to think about the shape of the energy economy in the years to come. And if the price of burning coal goes up—whether it’s due to a carbon tax, more stringent regulations, or higher costs associated with nasty environmental pollution—that’s a problem. Then there are the optics. Coal is a dirty, dangerous industry. This week alone, two coal miners in West Virginia died in a mine accident, and nearly 300 miners died in a mine fire in Turkey. Unlike renewables or natural gas, coal leaves toxic byproducts. And just as the conundrum of how to deal with nuclear waste can help make nuclear power plants financially problematic in the long term, burning coal to create electricity imposes costs on utilities long after its use. In February, between 30,000 and 39,000 tons of coal ash in a pond owned by Duke Energy, at a retired coal plant in North Carolina, leaked into the Dan River. This disaster has proven to be a personal and financial embarrassment for the company. Gov. McCrory quickly divested his shares in Duke Energy after the spill. At this spring’s annual meeting, an environmentalist got up and dared CEO Lynn Good to go on a canoe trip on the Catawba River, which runs through areas where coal ash ponds are located. The company has said that it should cost between $7 and $10 billion over a couple of decades to clean up the rivers and change how it manages the rest of the coal ash it is storing in the rest of the state. Even if the cost is only a fraction of the total, it significantly erodes whatever cost advantage coal enjoyed over other energy sources. For big utilities, publicly renouncing coal has become de rigueur. Despite its reliance on coal, Duke describes itself as “a sustainable electric and gas company.” Before today’s announcement, Duke has been moving slowly to phase out the black stuff. According to its 2013 Sustainability Report, Duke announced 15 retirements of coal-burning plants between 2011 and 2014, representing 3,830 megawatts of generation capacity in North Carolina, South Carolina, Indiana, and Ohio. By 2018, the company says, it will reduce its pre-2011 coal capacity by 25 percent. When coal plants shut down in the U.S., they’re generally replaced by generators that burn natural gas, as Duke is doing in Florida. And Florida—which is likely to suffer disproportionately from global warming—is now where the rest of the country is likely to be in a decade or so: According to the Energy Department, coal’s market share in electricity generation in Florida has fallen from about 38 percent in 2000 to about 20 percent in 2012, while natural gas already accounts for 75 percent of generation. Of the state’s 10 largest power plants, only one, Duke’s Crystal River Plant, uses coal. And Crystal River’s coal-fueled output will be halved in a few years. (The other two coal-burning units at Crystal River, built in the 1980s, have been equipped with scrubbers that will allow them to comply with tighter emissions restrictions.) And if Florida were ever to get its act together on renewables—in the Sunshine State, solar accounts for only an infinitesimal portion of electricity production, which is a topic for another column—it could probably produce virtually all the electricity it needs without having to burn a single lump of coal. The war on coal is far from over. But in the U.S., it is well underway.